Whether it’s the ‘googly’ in cricket, the ‘slam dunk’ in basketball or the ‘onion bag’ on the football pitch, every sport contains its own quirky terminology. 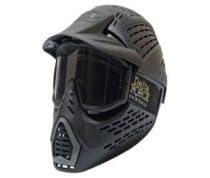 Paintball is no different, which is why the friendly team at Delta Force Paintball have put together this easy to read ‘Paintball Vocabulary’ guide for our readers’ convenience. Do you know your paintball markers from your hoppers? Find out below! OK, so this one kind of speaks for itself. 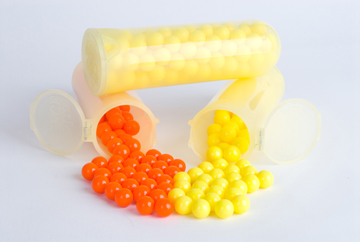 Paintballs are round capsules containing special non toxic, biodegradable, water soluble paint that are fired from paintball guns. To put it simply, they are the ammunition you will need in order to win! 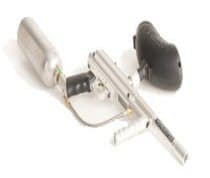 An alternative term used for a paintball gun. 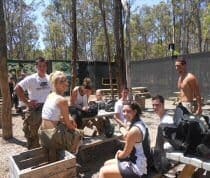 They are referred to as markers as one of the objectives of paintball is to mark or tag your opponent. Also, a marker sounds a lot less threatening than a gun! A rounded plastic container that is fitted to the top of each players’ marker (like a magazine is slotted into a rifle). 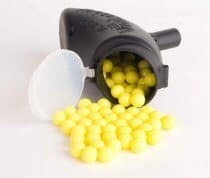 Hoppers usually contain 150-200 paintballs. Custom built, waist mounted paintball carrier. 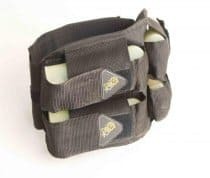 Can fit up to four ‘pods’ which carry 100 paintballs each, enabling the wearer to carry an extra 400 paintballs into a game. 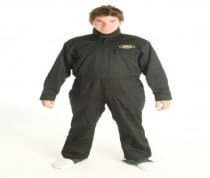 These issued as standard, specially padded black overalls are supplied to every player to keep their clothes clean as well as to provide a useful layer of protection! No, these aren’t the goggles you used to wear at your school’s swimming gala. These are full head protection helmets built to provide both complete safety and comfort. 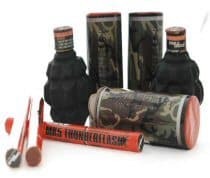 This is a general term used for smoke grenades, paint grenades and flashbangs that are available to purchase from the on site basecamp shop. The game scenario or field in which a paintball game is played in. These are usually themed scenarios filled with natural and artificial cover. 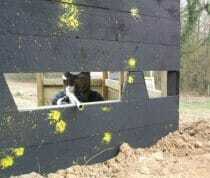 Delta Force Paintball game zones include the Speedball Arena and London Apocalypse. This is where you spend all your time within games. 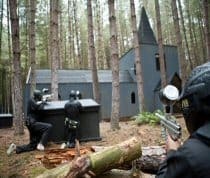 All Delta Force Paintball basecamps have top class facilities including an on site shop, free tea and coffee, secure lockers and flushing toilets. Now you’re an expert on all things paintball, you can secure your booking by calling one of our friendly event coordinators on 0203 869 9301. We are open 24 hours a day, 7 days a week!